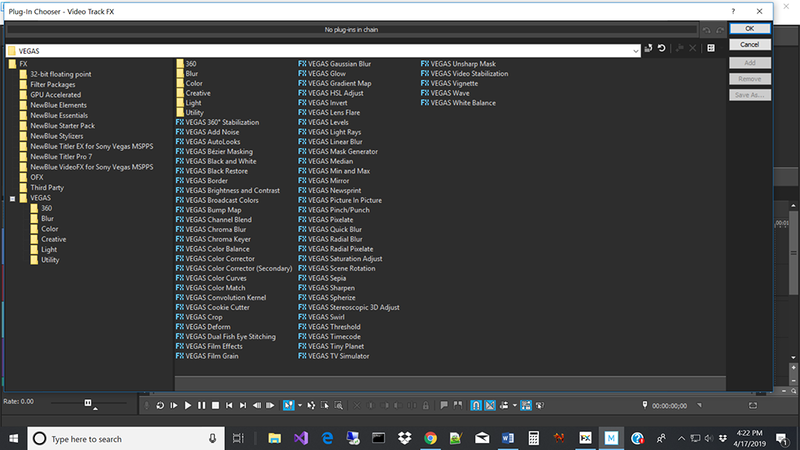 I upgraded my Movie Studio 13 to VEGAS Movie Studio 16 Suite and installed all the files with their appropriate license numbers. When I open Movie Studio 16 my NewBlueFX App Manager shows that my license is current for the Supreme Package and the Titler Pro 7 Express. However, when I try to open up the effects in Movie Studio, the Supreme Package components seem to be missing. The email address for my Movie Studio license and NewBlue license are the same, so I think that is ok. I installed Movie Studio first and then installed the NewBlue components. I am wondering if there is a specific order of steps I should have taken. Just to check, please click one of the "fx" buttons to see a Plug-In Chooser window. Elements, Essentials, Stylizers, Titler Pro 7. And did you restart your VEGAS product after installing the add-ons? The NewBlue Starter Pack, NewBlue Filters, NewBlue Video Essentials VI for Windows, and SeMW are missing. What led me to discover this is that when I first installed the Suite I had FX component called VideoTuneup and it is now missing. In the new version of Vegas Movie Studio Platinum 16, they have removed Folder view from the Video FX, Transitions and Media Generators tabbed windows. This terrible change to the program is creating confusion for some people. vkmast has already explained the alternate method for seeing "folder view" in Vegas Movie Studio. 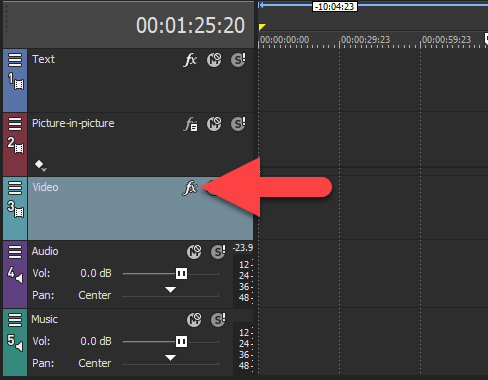 To see exactly which FX Vegas can see, you need to open the Plug-In Chooser window. Press the fx button on the Video track. When you have this window open, please take a screen shot and upload to the forum. if you overlap two events on the timeline and right-click (see "hand") on that area. You should then see the relevant window (note that my screenshot includes Transitions from my other installs as well). My SEMW folder in VMS 16 Platinum has only their Auto Levels plug-in (v.1.0.11.0), which seems compatible. As Doc said, NewBlue Video Essentials VI for Windows does not come with Vegas Movie Studio Suite 16. NewBlue Filters are from another install as well, not from VMSSuite 16. And NewBlue Starter Pack (with MSPPS) came with Movie Studio Suite 13, and with MSS 12 as well AFAICR. to uninstall it. I think the "Video tune up" plug-in came with MSPPS in MSS 12 and/or 13. And be sure not to confuse Titler EX with Titler Pro 7 Express! And regarding NewBlueFX, the thread linked below and the comments there from DoctorZen are definitely worth a GOOD read! Here is my screenshot. I am puzzled why I am missing the Video Tuneup component. Re your Video Tuneup, please read carefully this thread (and the screenshots) www.vegascreativesoftware.info/us/forum/psychedelic-or-psychotic--105070/ . That thread and DoctorZen's comments such as post #10 in this thread I linked to earlier may help understand the issue(s). I am puzzled if all the NewBlue "components" shown in your screenshot are in fact working. You seem to have the items of Supreme Package listed (at least the folders. And you have not commented on the Transitions so far even though I have posted two screenshots for you to check.) Can you please tell us if (any of) those plug-ins in your screenshot from Supreme Package and NB Titler Pro 7 Express are available? I tried some of the transitions out on two pieces of video and they did work. Thank you!